Shikoku Island, the fourth largest island in the Japanese archipelago. Matsuyama, a historical, quiet town facing the serene inland sea 1976,after the turmoil of years of student demonstrations, there came a time of nihilism. The new generation was given the nickname "Age of Three Nothings" signifying "Giving nothing, caring fornothing, being moved by nothing". Etsuko (15) lives with her reticent father and hard-working, fussy mother. They run a little dry-cleaning business. With them is Etsuko's grandmother who looks after the house and her 'brilliant' older sister who is leaving to attend a top college. Etsuko feels useless, with no role to play in the household. The irony is that even though she is far from being an excellent student, she still managed to get into the best local high school. The emptiness of this achievement only worsens her sense of futility. One day she decides to run away from home. Her family don't flinch, assuming she just went out for a walk. Despondent and alone, even this gesture ignored, Etsuko stands on the sea shore and stares out across the waves. In the distance, she caches sight of something it's a rowing team gliding through the water. At that moment something sparks inside her. She can't get this image out of her mind and sets her heart on joining the rowing team at the new school. 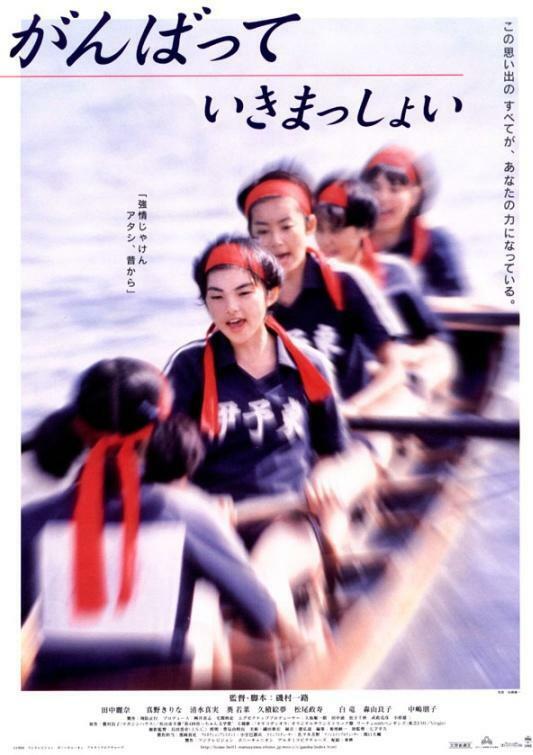 However she finds out that since it used to be a boys' school, traditional attitudes persist: there is no rowing team for girls. In a solution to all her recent frustrations with life, she decides to do something about this. She bullies four other girls into forming a team. With their hearts not really in it however, their season ends in a humiliating defeat. Further burdened by the appearance of her childhood sweetheart on the boy's team, she begins to flounder. An awkward relationship with their melancholic coach followed by an injury that bars her from sport, threaten to wreck Etsuko's self-confidence. Just when it seems she will have to give up all that she struggled for, she finds it in herself to continue. "Rowing is everything for me", she says. By the second reason, the girls have grown. With one voice they pull their oars through the water, heading for their first victory. The 2005 television drama "Give It All," starring Anne Suzuki, was also based on the same original novel.